You’ve heard the advice countless times, but it is oh so easy to ignore: You simply must back up your Mac. If you don’t back up your files, it’s a question of when—not if!—you’ll lose something important or irreplacable. Instead of making a hard-to-keep New Year’s resolution like losing weight or exercising more, this year resolve to do something that only takes a smidgen of willpower to get started and then mostly takes care of itself: Make—and manage—regular backups of your computer. This isn’t new advice. Intellectually, you know should be backing up your files. It just seems like so much effort, and your hard drive seems fine anyway. So let’s make getting a reasonable backup in place as painless as possible. Chris Breen went into great detail about determining just what you need to back up nearly a year ago in his piece “How to make a solid Mac backup plan.” You can get away without backing up a surprising number of files: apps from the Mac App Store, apps that you can easily redownload from elsewhere on the Web, and iOS apps. You can also skip backing up your email, so long as you use an IMAP email account (or a service like Gmail) where your messages remain stored on a remote server. Ditto for your music, if you use a service like iTunes Match. Of course, it doesn’t hurt to back up files like these—and doing so certainly makes restoring your data faster in the event of catastrophic failure—but if you’re looking to start small, you can reasonably avoid backing up such data if you’re looking to save time or hard drive space. Click on the blue button to download Dropbox. That’s it. Now, there’s a Dropbox folder in your main user folder on your Mac. If all went well, that Dropbox folder should appear in the sidebar of your finder windows, too. You get 2GB of storage space with Dropbox, gratis. If you don’t have much in the way of photos and documents to back up, that may be plenty. (If you do need more space, you can pay $99 per year for 50GB.) Move your important documents and photos to the Dropbox folder, and the service will automatically sync them to Dropbox’s servers on its own. If your hard drive goes belly up, you can simply install Dropbox again on your replacement, and the service will automatically download all your synced files. Installing Dropbox, and keeping your most important files there, can take mere minutes. And as long as you ensure that you save your important data to that folder, you’re golden. But if you’re willing to spend a little more time and a little more cash, there are other approaches that can back you up even more completely. As you probably know, you have impressive backup software built into your Mac, for free. But if you never configure Time Machine, then it can’t help you. 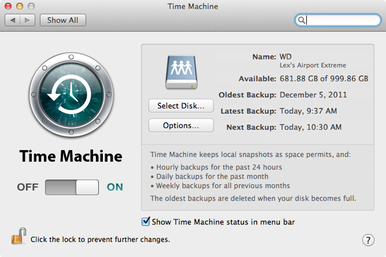 The good news is, configuring Time Machine to back up your computer takes just a bit of time. Buy or acquire an extra hard drive. (See our buying guides for external hard drives and for portable hard drives.) This is ridiculously cheap at this point; you can get at least a terabyte of storage space for less than $100. All you need is a drive that works with your Mac; USB drives are still the most affordable; Thunderbolt drives will likely be faster. Most of the time, Lion should ask you whether you’d like to use the newly-connected hard drive for Time Machine backups. Say yes, and your Mac will automatically back up your files to the drive as needed. It’s great, and it’s mostly painless. If you’ve bought a big enough drive, you’ll have a copy of everything in case of emergency. Time Machine stores incremental backups of your data in time-based snapshots. So if you updated your big presentation for work yesterday, and realize today that in fact you screwed everything up, you can use Time Machine to step back to an earlier version of that file. And you can recover the file if you accidentally delete it, too. Time Machine’s smart enough to only back up data that’s changed; that way, instead of recopying the complete contents of your hard drive each time your Mac starts a new backup, only the updated and new files are transferred. In your main drive fails, your latest Time Machine backup should contain a nearly up-to-the-minute snapshot of how everything looked before the crash. And unlike Dropbox, Time Machine backs up pretty much everything on your Mac—you don’t need to make sure you’re putting all your important stuff in a single folder. You can even use Time Machine to back up to remote network drives (say, drives connected to your Airport base station). With CrashPlan, you needn’t worry about buying (or replacing) external hard drives, and obviously you don’t need to worry about connecting one either. As with all online backup services, CrashPlan works by backing up your files over the Internet. And since CrashPlan backs up your data on its own system, you avoid the single-point-of-failure situation that a single Time Machine backup drive creates. You sign up for CrashPlan, pick out a plan, download the CrashPlan software—and then wait. It automatically backs up your Mac over the Internet to CrashPlan’s servers. You can launch the app and watch its progress, or just leave it closed and it will silently do its thing. Out of sight needn’t be out mind: CrashPlan can email you or message you via Twitter with status updates on your backups—along with warnings when a computer hasn’t backed up in a few days. When you need to restore a file, you can do so via the CrashPlan app or the website. Like Time Machine, CrashPlan even backs up multiple versions versions of your files, meaning you can get at earlier copies of a document if need be. And it holds onto files you delete, too. The service offers impressive peace of mind for the price. None of these options—Dropbox, Time Machine, or CrashPlan—offers a means of creating a bootable backup. That is, you can’t start up your Mac with any of these options if your main hard drive fails. But that’s okay now, thanks to Lion’s Recovery Mode. If you’re running Snow Leopard, or if you aren’t comfortable with Recovery Mode, you probably want to start making a bootable backup as well; the most popular tools for doing so are SuperDuper and Carbon Copy Cloner. But those require a smidgen more care and attention, and we want to ensure you keep your New Year’s resolution, so let’s not sweat those options this time around. It’s wonderful that you’ve finally started backing up, through whichever mean(s) you chose. But who’s verifying that your backups are working? A flawed backup is about as useful as no backup. Verifying your backup should help you sleep easy at night. New year, new you. Specifically, a you who needn’t worry about what might happen to your precious data if the unthinkable happens to your Mac’s hard drive. The best backup routines require precious little maintenance (beyond Verify Your Backups Day); they just work. Before you start crooning Auld Lang Syne, get over the hurdle. Setting up a reasonable backup strategy needn’t take much time or money—just a few minutes of focus. You’ll thank yourself later.